An earlier version of this post appeared on Potatoes, Rhubarb, and Ox. 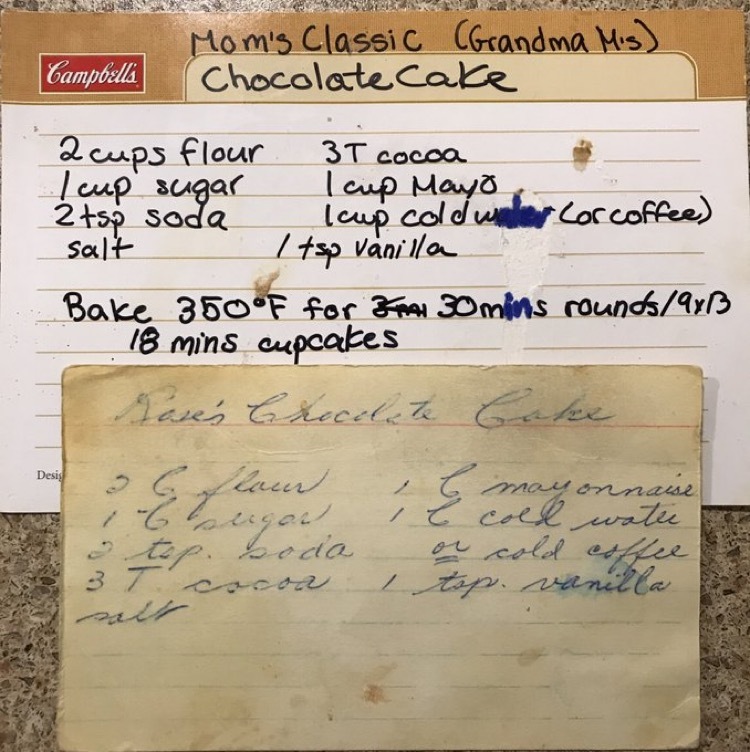 The original recipe for the author’s grandma Myrtle’s cake and the author’s recipe from her mom. My grandma Myrtle’s box and cooking style is filled with items particular to a wife in post-war Calgary who was involved in community organizations and the lives of her children. The box also reflects different periods of my grandmother’s life and the evolution of popular culinary influences and the changes in her family life. The presence of“Rose’s Chocolate Cake” in my grandmother’s recipe box reflects the intersection of women’s friendships with their everyday kitchen labour. By attributing the origin of the recipe to Rose we know its provenance and also receive a personal endorsement for the quality of the recipe. The different names attributed to recipes in the box demonstrate that my grandmother’s cooking evolved with the time (though I know her techniques and practices remained firmly grounded in the period in which she learned to cook based on antidotal evidence from my mother). For example, the presence of my uncle’s wife’s lasagna recipe and my own mother’s cheesecake recipe in Myrtle’s box shows that her adult children became important culinary influences in her life. Cookbooks and recipe boxes passed from generation to generation are what Tye calls “a tangible connection to a female past.” Exploring my grandmother’s recipe box and finding the origin of my family’s favourite chocolate cake connects me not only to my long-passed grandma, but also to a larger network of women and their shared skills and experiences. Returning back to the cake for the Fall Fair, for the filling options I explored the cookbook my grandma Caroline had given me while I was home in June. The Monarch Flour Company sponsored cookbook “Cooking Made Easy” by Anna Lee Scott (who may, or may not, have been one person or a facsimile) was used in my grandma’s domestic science class. Intended for use in a high school home economics class and published by a flour company,“Cooking Made Easy” was a clever way for the Monarch Flour Company to implant itself into the minds and kitchens of the country’s future housewives. The book was laid out by the creator(s) in a manner intended to teach progressively difficult baking and cooking skills to students. My grandma and I spend the afternoon reading through the cookbook together at her kitchen table. Grandma didn’t think that her class had ever finished going through the book, but as we flipped through she noted that our family’s favourite Waffle and Johnny Cake recipes came from this book. The stains on the pages were witness to this fact. 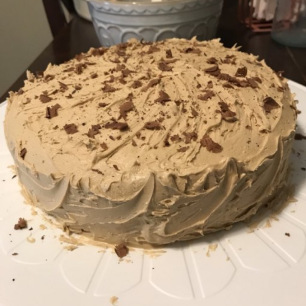 In the cake section, we laughed at the author’s phrasing “how to elaborate a cake.” We were drawn to the Mocha Cream Filling and thought it sounded delicious, so I thought it would be nice to test it as a possible flavour for my Fall Fair cake filling. The continued presence of this particular cookbook in Caroline’s kitchen and it being the origin of some of the family’s go-to recipes shows the importance of early culinary experiences on forming the kitchen habits. Later, my mom and her sister remembered that their mother had often used mint icing on the cake, so I knew that should be the other flavour I tried. I spent the last few weeks of August planning and testing my cake entry. The cake itself was not an issue as I had made it countless times before. The real challenge for me was making the custard for the filling. The first batch of the Mocha Cream Filling went well, however, I did discover that the instructions suggesting at various points that you “cook for 2-3” minutes were a bit off. I had to cook the custard at each step for well over the suggested time in order to make it thick enough. 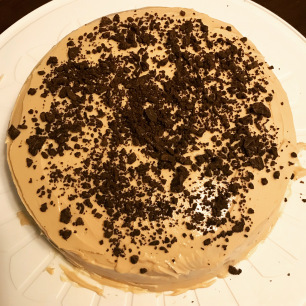 Overall, the first Mocha Cake turned out well and I was able to share it with friends! My second cake attempt used a recipe for a plain cream custard, to which I added mint extract. Honestly, I counted the second Mint Cake as a flop, mostly because the custard failed to thicken enough. The custard flowed over the sides of the cake into a huge mess. I was able to salvage the cake by putting it in the fridge to stiffen up the custard, but a lot of the custard was lost. For some reason my icing came out stiffer than usual, making the cake harder to ice. The heat of the day caused a bit of a mess as I iced the cake and the custard melted. 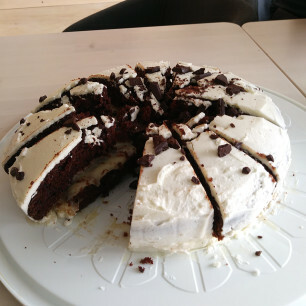 In the end, the cake still tasted good and the coworkers I shared it with enjoyed it! Given the challenges I had with the Mint Cake, I decided that Mocha Cake was the flavour I’d like to submit for the fair and set about doing my final practice cake, which turned out very well. I took the time to make sure the custard was thick enough and had light fluffy icing too! I got to share the cake again, and received some good feedback about adding a stronger coffee flavour for the final contest cake from the coworkers. I decided to make my final cake the day before I needed to submit it to the fair.I felt fairly confident in my abilities given that I had made two successful Mocha Cakes before. The morning of the final bake, things did not go as planned. I pulled my cakes out of the oven and realized that they were lopsided. I figured I could even them out in the stacking process. Unfortunately, this is not where the problems stopped. I made my custard and after spending what felt like ages waiting for it to thicken, I thought I had reached the correct consistency; I had not. As soon as I set the top cake layer down on, custard began to spill everywhere. 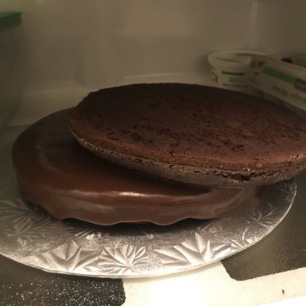 I put the cake in the fridge in hopes that it would stop sliding,but after a few hours came back to a lopsided mess sliding on to the cake plate. I decided the cake was definitely not going to be salvageable for submission and started again from scratch. I took care to ensure the cake batter was evenly poured in the pans and tested the custard by pouring it on to the side of bowl to make sure it was going nowhere. I assembled the cake, let it set in the fridge, then iced it and put it in the fridge overnight. The next evening, I got the cake into the required ziplock bag(s) and took it to Fergus. As Elizabeth Driver asserts in her article “Cookbooks as Primary Sources for Writing History,”, preparing recipes from historical sources is important for understanding if recipes worked and were useful in the kitchen. A cookbook, she argues, “is fully understood only when the recipes are executed, the food consumed, and the outcome analyzed using all one’s senses…cooked food is…and expression of the printed text.”When the historical recipes you test come from your family, the process of understanding that recipe is deepened by a personal connection and knowledge of your family history. Entering the fall fair in a category called “Family Favourites” allowed me to create something that combined both sides of my family. My grandma Myrtle lived in the city and learned to cook during the Great Depression and Second World War. Though Myrtle’s recipe box also shows the changing food trends of the 60s and 70s, I can see how the understandings of food rooted in the 30s and 40s were passed down to my own mother in how she approaches food and the kitchen. My grandma Caroline grew up in a small town and took high school home economic classes in the 50s. Her large lunchtime meals at holidays accompanied by Jello desserts are clear reflections of the place and time in which she learned to cook. Some of the recipes my grandmothers were exposed are most certainly similar, but the eras in which they learned to cook and the locations in which they lived created a different understanding of taste and food. The judges’ decisions! The blue ribbon now hangs in the author’s kitchen. This Mocha Cake was the point where the two different food cultures that inform my own met. It was fun to use this as an opportunity to connect with both of my grandmothers and to challenge my own skill as a baker. Regardless of the outcome (second place! ), I am proud of this cake. Bake 350oF for 30 mins. Use two rounds or one 9 x 13in pan. Grease with butter and flour pans. Add 2 tbsp. instant coffee. Cover and place over boiling water; stir occasionally, bring to scalding point. Gradually stir about half of the coffee-flavoured milk into the dry mixture. Return all to double boiler and cook, stirring constantly, until thickened. Cover and cook 2-3 mins (or longer). Gradually stir in a little of the hot mixture into the egg. Stir back into double boiler and cook, stirring constantly until egg thickens the mixture sufficiently. Test the thickness by dropping on to the side/bottom of a bowl. If it doesn’t run, it is ready. Cool slightly, then stir in ½ tsp. vanilla. Stirring frequently, cool to lukewarm before spreading. 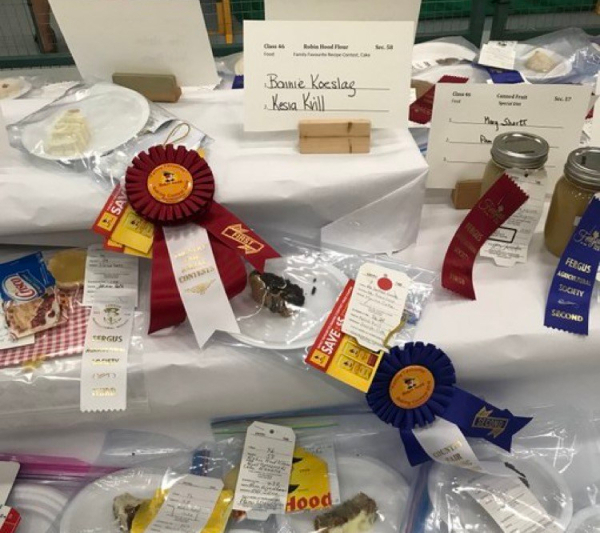 Kesia Kvill is a PhD Candidate at the University of Guelph.Her dissertation focuses on food control in Canada during the First World Wara nd the relationship between government and women. She received her MA from the University of Calgary where she wrote about public dining and Western Canadian identity. Kesia’s research interests include food, cultural, rural, gender,domestic, and public history. She also maintains a personal food history research blog, Potatoes, Rhubarb, and Ox. Diane Tye, Baking as Biography: A Life Story in Recipes (Montreal & Kingston: McGills-Queen’s University Press, 2010), Ch. 1, Kindle Edition. Tye, Baking as Biography, Ch. 1, Kindle Edition; Elizabeth Driver, “Cookbooks as Primary Sources for Writing History,” in Food, Culture & Society, DOI: 10.2752/175174409X431987, 271. Tye, Baking as Biography, Ch. 1, Kindle Edition. Driver, “Cookbooks as Primary Sources for Writing History,” 259, 264. Great work, Kesia. But makes me kind of jealous. My Slovak grandmothers did not use cookbooks or use precise measurements. It was memory, touch, and texture. I mastered the chicken soup, but sadly did not learn how to make Babka’s homemade noodles – which she made every week!